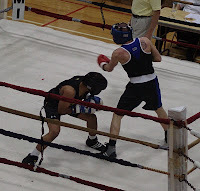 I went to watch some collegiate and amateur bouts down in Oxford on Saturday. Miami University was hosting the cadets from West Point (last year's collegiate champs, nice write-up in NY Times). 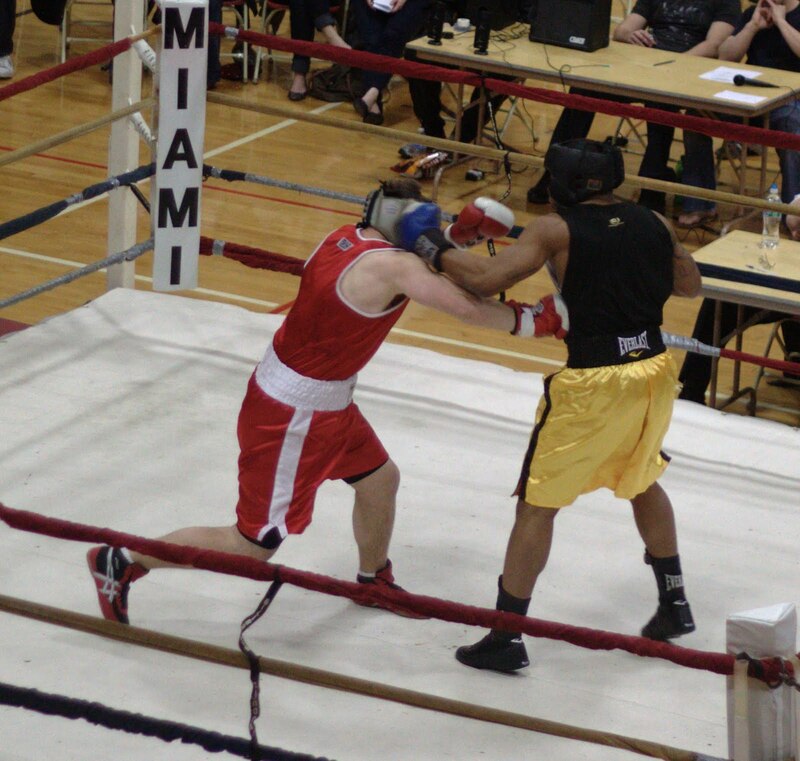 If you're used to the glammed-up barroom brawling of UFC or even the raw knock-out power of professional boxing, then the style and speed of amateur boxing might come as quite a surprise. I really like the amateur fights because they tend to pivot on conditioning, thinking and skillful execution rather than landing lucky or brutal head-shots. 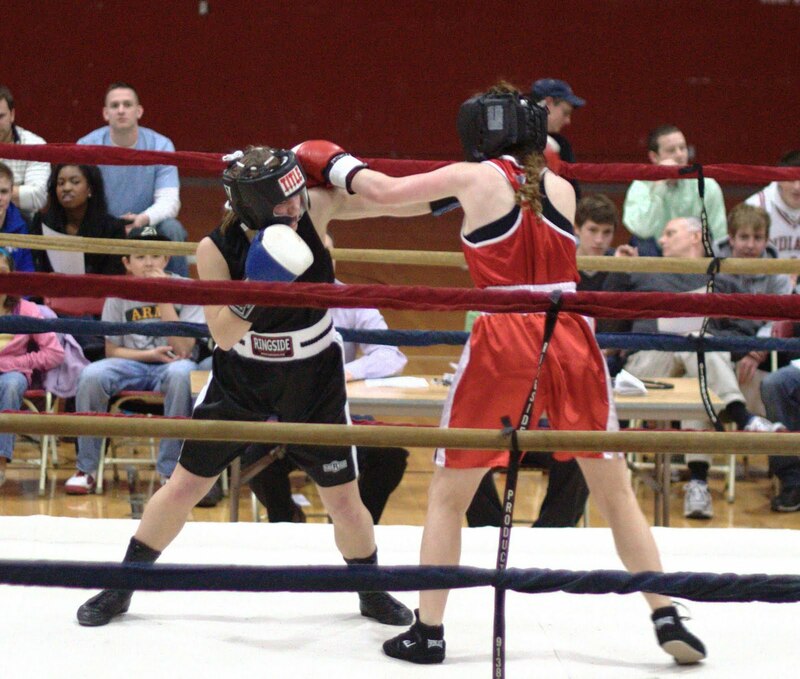 The 14-bout evening started out with a couple of tough young ladies, one from Cincinati, one from Oxford, going three rounds. It's hard to do match-ups for women because there are just fewer boxers in an already small pool of athletes (since boxing is no longer an NCAA sport). 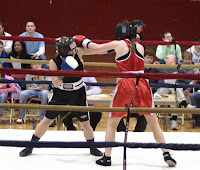 The winner of this bout threw very disciplined, quick, straight punches which her clearly less experienced opponent was ill-equipped to catch or counter. This fight was followed by a few match-ups with local fighters out of Cincinnati, OSU and Miami University. The early fights consisted of lots of off-balanced brawling. The result of "first fight" jitters and inexperience for many of these young athletes. The cadets from West Point fought out of the blue corner for the remainder of the evening against a line-up consisting of mainly Miami University fighters, with the occasional fighter from OSU or Xavier thrown in to the mix. From the first cadet to fight, on up to the "main event" it was clear why these gentlemen have won three championships in a row. 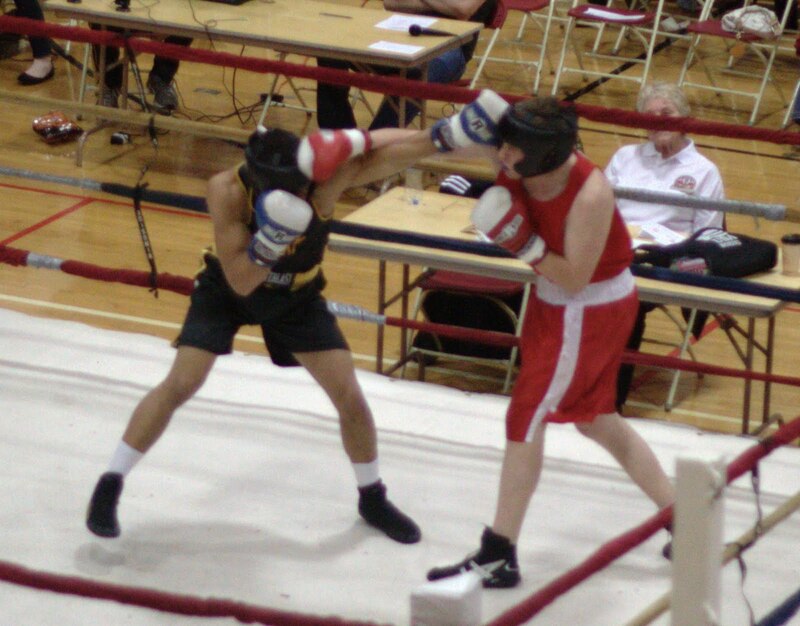 A string of cadets won judges decisions handily over their opponents. 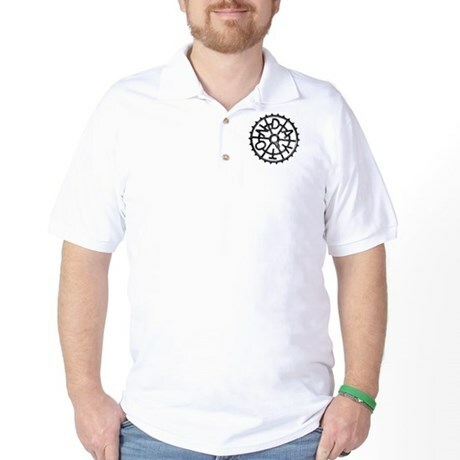 In the process demonstrating solid fundamentals, and coolness under the frequent early, but generally dissipative, aggressiveness of their foes. 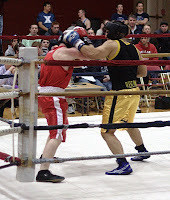 Then, in the first bout at 132lbs (the second being the "main event" of the night), Lang Clarke of Army landed a solid combination to the head followed-up with a deliberate two-two that sent the man from Xavier to the mat (the referee was in the midst of "stop" as the second right landed). The first and only knock-out of the evening. The Xavier athlete was back on his feet (to the relieved cheers of the crowd) after a quick nap and a check from the ring-side doc. 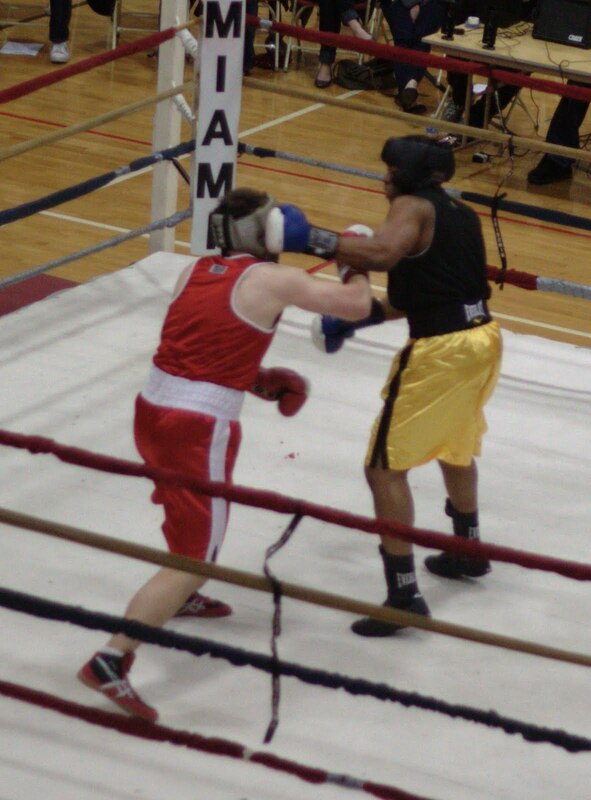 The only heavy-weight bout of the night was stopped by the referee near the end of the first round. The fighter from West Point landed repeated hooks-to-the-head which the young man from Oxford was not defending. The fight at 195lbs was relatively surprising, not in outcome (the cadet won), but in tactics. Previously the cadets had employed a shorter and simpler version of the rope-a-dope tactic when their less disciplined and less well-conditioned opponents came out swinging. Rather than stand and brawl toe-to-toe, they defended and let the other fighter tire, then exploited that self-inflicted weakness with steady "work" for the rest of the round. This cadet stood up inside his opponent's early windmill, and landed straight punches and upper cuts to the head. One or two furious windmillings punctuated by deliberately thrown and well-landed opposing hits was all that it took for the windmill's blades to drop and the hub to wobble on it's axis. Referee stops contest. The crowd was ready for their main event. A nice cheer went up for the wiry 132-pounder from Oxford as he stepped in the ring. Yours truly was the only one to cheer when the young man from West Point entered the ring (much to my wife's embarrassment). After she heard the raucous cheer when they actually introduced the Oxford fighter, she said, "OK, you can go ahead and yell for that West Point guy," so I did. Both fighters were about equally conditioned, which made for a much more exciting fight. They were both able to work (with varying levels of effectiveness) for the majority of each round. The fighter from Oxford threw a great volume of widely-arcing punches, most of which seemed ineffective to me due to the cadet's competent defense. After the repeated, straight head-shots landed by the cadet in the third round, I thought the decision would go his way (if the fight was not stopped sooner, which had been the outcome of this sort of pounding previously). 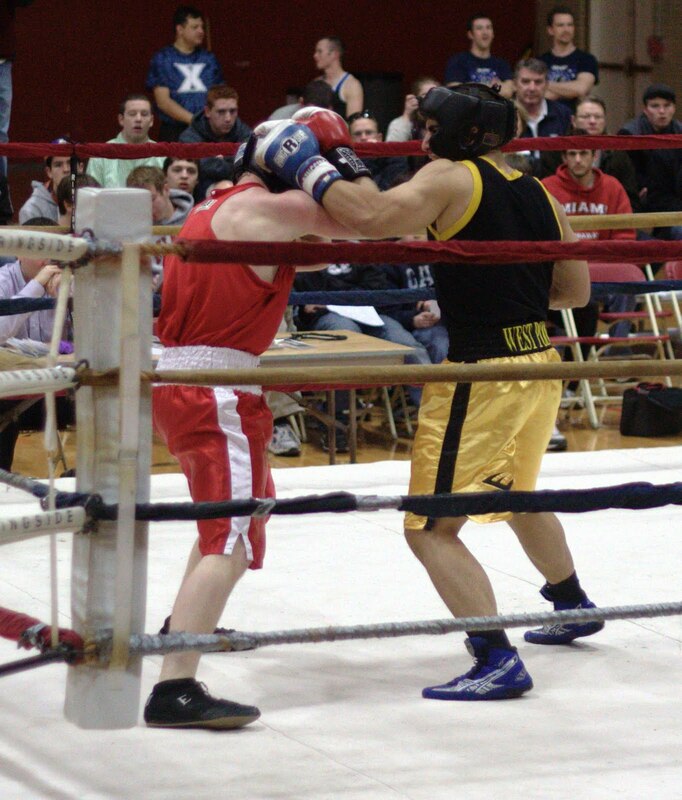 The judges had a different perspective on the bout, so the decision went to the man from Oxford, who, much to his credit, was able to recover repeatedly from the wobbliness induced by these direct blows and swing away until the bell relieved him. The coaches, medical and officiating crew at Miami University should be congratulated for putting on such a professional event that took good care of these young athletes, and allowed them to further develop their skills. Sparring partners are endowed with habitual consideration and forbearance, and they find it hard to change character. A kind of guild fellowship holds them together, and they pepper each other's elbows with merry abandon, grunting with pleasure like hippopotamuses in a beer vat.